As the heart of the 2015 hurricane season approaches, you need to be prepared. Thankfully, weather forecasters are predicting a relatively calm hurricane season this year. With hurricane season tending to peak in September and October, things have so far been quiet in the Atlantic. It is important to use the 2015 hurricane season as an optimal opportunity to prepare for a more active year next year. Palm Harbor Homes is always prepared to weather the storm. Here is what you need to know. The Bonanza Flex manufactured home by Palm Harbor offers 3 Bedrooms, 2 Baths, 2,302 Sq. Ft. – and all the strength and beauty Palm Harbor puts into its homes. 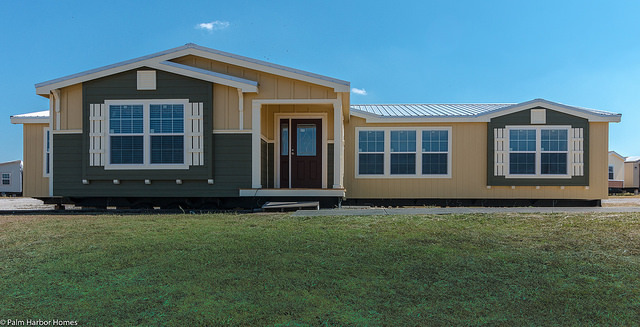 Even if you don’t own an actual FORTIFIED® hurricane resistant manufactured home, you need to make sure that you take precautions to strengthen and protect the vulnerable areas of your residence. Check all supporting structures, tie downs and the foundation to keep your home solidly in place. Have a supply of plywood ready to cover and protect your windows. Finally, if you haven’t already purchased hurricane and flood insurance, do so immediately. Rates can be incredibly reasonable and having that financial assurance is invaluable. Having a back stock of food, water, and medical supplies is useful in any type of disaster situation. You should have at least two weeks’ worth of food and water stored in your pantry. Emergency medical kits are available that contain all the basics you will need. Make sure that everyone in your home has a flashlight, battery operated AM/FM radio, and loads of extra batteries. People with medical issues that require electric equipment may want to invest in a diesel generator. Having quick access to these items is necessary to surviving a severe storm. Your family should sit down before each hurricane season and discuss your plan. You should map out escape routes from your home along with marking storm shelters that are available in your area. Be aware of evaluation routes in your area. A bit of preparation can save your life. If you have questions about how to hurricane proof your manufactured home, contact Palm Harbor Homes at 1-888-466-3718. We are hoping for a safe and quiet 2015 hurricane season!